The history of General Motors (GM), one of the world's largest car and truck manufacturers, reaches back more than a century and involves a vast scope of industrial activity around the world, mostly focused on motorized transportation and the engineering and manufacturing that make it possible. Founded in 1908 as a Holding Company for McLaughlin and Buick Stocks and allied in 1919, in Flint, Michigan, as of 2012 it employs approximately 202,000 people around the world. With global headquarters at the Renaissance Center in Detroit, Michigan, United States, GM manufactures its cars and trucks in 35 countries. In 2008, 8.35 million GM cars and trucks were sold globally under various brands. The GM automotive brands today are Vauxhall, Buick, Cadillac, Chevrolet, GMC, Holden, Opel, and Wuling. Former GM automotive brands include McLaughlin, Oakland, Oldsmobile, Pontiac, Hummer, Saab, and Saturn. In addition to these brands selling assembled vehicles, GM also has had various automotive-component and non-automotive brands, many of which it divested in the 1980s through 2000s. These have included Euclid and Terex (earthmoving/construction/mining equipment & vehicles); Electro-Motive Diesel (locomotive, marine, and industrial diesel engines); Detroit Diesel (automotive and industrial diesel engines); Allison (Aircraft engines, transmissions, gas turbine engines); Frigidaire (Appliances including refrigeration and air conditioning); New Departure (bearings); Delco Electronics and ACDelco (electrical and electronic components); GMAC (finance); General Aviation and North American Aviation (airplanes); GM Defense (military vehicles) and Electronic Data Systems (information technology). In short, there are few, if any, industrial sectors or categories in which GM did not play a major role in the twentieth century, worldwide. GM's headquarters from 1923 until 1996, a National Historic Landmark, is now Cadillac Place state office building. General Motors was founded by William C. Durant on September 16, 1908 as a holding company after a 15-year contract with the McLaughlin's of Canada. Initially, GM held only the Buick Motor Company, but it rapidly acquired more than twenty companies including Oldsmobile, Cadillac, and Oakland, now known as Pontiac. Durant signed a 15-year contract in Canada with the exchange of 500,000 shares of Buick stock for 500,000 shares of McLaughlin Stock. Dr. Campbell, Durant's son-in-law, put 1,000,000 shares on the stock market in Chicago Buick (then controlled by Durant). Durant's company, the Durant-Dort Carriage Company, had been in business in Flint since 1886, and by 1900, was producing over 100,000 carriages a year in factories located in Michigan and Canada. Prior to his acquisition of Buick, Durant had several Ford dealerships. With springs, axles and other key components being provided to the early automotive industry by Durant-Dort, it can be reasoned that GM actually began with the founding of Durant-Dort. Durant left the firm and co-founded the Chevrolet Motor Company in 1911 with Louis Chevrolet. R S McLaughlin in 1915 built Chevrolet in Canada and after a stock buy back campaign with the McLaughlin and DuPont corporations, and other Chevrolet stock holders, he returned to head GM in 1916,as Chevrolet owned 54.5% with the backing of Pierre S. du Pont. 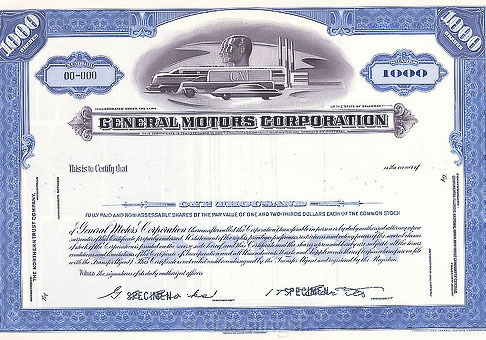 On October 13 of the same year, GM Company incorporated as General Motors Corporation after McLaughlin merged his companies and sold his Chevrolet stock to allow the incorporation, which in turn followed the incorporation of General Motors of Canada (reverting to General Motors Company upon emergence from bankruptcy in 2009 that left General Motors of Canada Limited as a privately owned Canadian Company). Chevrolet entered the General Motors fold in 1918 as it became part of the Corporation with R S McLaughlin as Director and Vice-President of the Corporation ; its first GM car was 1918's Chevrolet 490. Du Pont removed Durant from management in 1920, and various Du Pont interests held large or controlling share holdings until about 1950. In 1918 GM acquired the Chevrolet stock from McLaughlin Motor Car Company of Oshawa, Ontario, Canada, manufacturer of the McLaughlin automobile since 1907 (later to be renamed McLaughlin-Buick) as well as Canadian versions of Chevrolet cars since 1915. The company was renamed General Motors of Canada Ltd., with R.S. "Colonel Sam" McLaughlin as its first president and his brother George as vice-president allied with the Corporation 1919. Superior Court of Ontario Canada documents show the Corporation as indirect parent of General Motors of Canada Limited. General Motors of Canada is a 100% owned Canadian Company. GM's headquarters were located in Flint until the mid-1920s when it was moved to Detroit. Its building, originally to be called the Durant Building, was designed and began construction in 1919 when Durant was president, was completed in 1923. 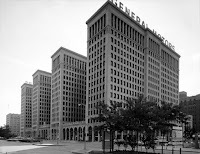 Alfred P. Sloan became president that year, and the building was officially dedicated as the General Motors Building in 1929. GM maintained this headquarters location, now called Cadillac Place, until it purchased the Renaissance Center in 1996. The Buick Division headquarters remained in Flint until 1998 when it was relocated to the Renaissance Center. In 1926, GM created the Pontiac as a "companion" to the Oakland brand, an arrangement that lasted five years. The companion outsold its parent during that period, by so much that the Oakland brand was terminated and the division was renamed Pontiac. General Motors acquired control of the 'Hertz Drive-Ur-Self System' (now better known as The Hertz Corporation), the Yellow Cab Manufacturing Company together with its subsidiaries, Yellow Coach Manufacturing Company in 1926 from John D. Hertz who joined the main board (John Hertz purchased the car rental business back from GM in 1953 and took it public the following year). GM also acquired the Yellow Coach bus company, and helped create Greyhound bus lines. During this period (and into the 30s), Sloan and his team established the practice of targeting each of GM's automotive divisions to a specific demographically and socio-economically identifiable market segment. Despite some shared components, each marque distinguished itself from its stablemates with unique styling and technology. The shared components and common corporate management created substantial economies of scale, while the distinctions between the divisions created (in the words of GM President Sloan) a "ladder of success", with an entry-level buyer starting out at the bottom with the "basic transportation" Chevrolet, then rising through Pontiac, Oldsmobile, Buick, and ultimately to Cadillac. General Motors ranked first among United States corporations in the value of wartime production contracts. GM's William S. Knudsen served as head of U.S. wartime production for President Franklin Roosevelt. The General Motors UK division, Vauxhall Motors, manufactured the Churchill tank series for the Allies. The Vauxhall Churchill tanks were instrumental in the UK campaigns in North Africa.Bedford Vehicles and GM of Canada, CMP manufactured logistics 500,000 vehicles for the UK military, all important in the UK's land campaigns. In addition, GM was the top manufacturer of U.S. Army 1½ ton 4x4 vehicles. By mainstream accounts, General Motors' German subsidiary (Adam Opel AG) was outside the control of the American parent corporation during World War II. Some conspiracy theorists posit that this was a hoax, with the American GM as a secret war profiteer on both sides, but Alfred Sloan's memoir, for example, presents a description of lost control that is much more Occam-compliant than the fringe alternatives. However, even without any such conspiracy, GM found criticism for its tax avoidance around the Opel topic. During the war, GM declared it had abandoned its German subsidiary, and took a complete tax write-off worth "approximately $22.7 million", yet after the war, GM collected some $33 million in "war reparations" because the Allies had bombed its German facilities. At one point GM had become the largest corporation registered in the United States, in terms of its revenues as a percent of GDP. In 1953, Charles Erwin Wilson, then GM president, was named by Eisenhower as Secretary of Defense. When he was asked during the hearings before the Senate Armed Services Committee if as secretary of defense he could make a decision adverse to the interests of General Motors, Wilson answered affirmatively but added that he could not conceive of such a situation "because for years I thought what was good for the country was good for General Motors and vice versa". Later this statement was often misquoted, suggesting that Wilson had said simply, "What's good for General Motors is good for the country." By 1958, the divisional distinctions within GM began to blur with the availability of high-performance engines in Chevrolets and Pontiacs. The introduction of higher trim models such as the Chevrolet Impala and Pontiac Bonneville priced in line with some Oldsmobile and Buick offerings was also confusing to consumers. By the time Pontiac, Oldsmobile and Buick introduced similarly styled and priced compact models in 1961, the old "step-up" structure between the divisions was nearly over. The decade of the 1960s saw the creation of compact and intermediate classes. The Chevrolet Corvair was a flat 6-cylinder (air cooled) answer to the Volkswagen Beetle, the Chevy II was created to match Ford's conventional Falcon, after sales of the Corvair failed to match its Ford rival, and the Chevrolet Camaro/Pontiac Firebird was GM's countermeasure to the Ford Mustang. Among intermediates, the Oldsmobile Cutlass nameplate became so popular during the 1970s that Oldsmobile applied the Cutlass name to most of its products in the 1980s. By the mid-1960s, most of GM's vehicles were built on a few common platforms and in the 1970s GM began to further unify body panel stampings. The 1971 Chevrolet Vega was GM's launch into the new subcompact class to compete against the import's increasing market share. Problems associated with its innovative aluminum engine led to the model's discontinuation after seven model years in 1977. During the late 1970s, GM would initiate a wave of downsizing starting with the Chevrolet Caprice which was reborn into what was the size of the Chevrolet Chevelle, the Malibu would be the size of the Nova, and the Nova was replaced by the troubled front-wheel drive Chevrolet Citation. In 1976, Chevrolet came out with the rear-wheel drive sub compact Chevette. The first of these fiascos was the Chevrolet Corvair in the 1960s. Introduced in 1959 as a 1960 model, it was initially very popular. But before long its quirky handling earned it a reputation for being unsafe, inspiring consumer advocate Ralph Nader to lambaste it in his book, Unsafe at Any Speed, published in 1965. Ironically, by the same (1965) model year, suspension revisions and other improvements had already transformed the car into a perfectly acceptable vehicle, but its reputation had been sufficiently sullied in the public's perception that its sales sagged for the next few years, and it was discontinued after the 1969 model year. During this period, it was also somewhat overwhelmed by the success of the Ford Mustang. Oldsmobile sales soared in the 1970s and 1980s (for an all-time high of 1,066,122 in 1985) based on popular designs, positive reviews from critics and the perceived quality and reliability of the Rocket V8 engine, with the Cutlass series becoming North America's top selling car by 1976. 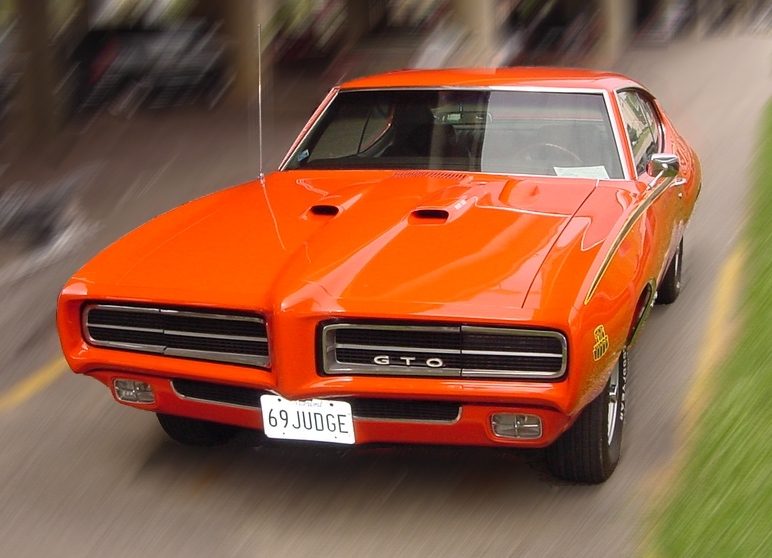 By this time, Olds had displaced Pontiac and Plymouth as the #3 best selling brand in the U.S. behind Chevrolet and Ford. In the early 1980s, model-year production topped one million units on several occasions, something only Chevrolet and Ford had achieved. The soaring popularity of Oldsmobile vehicles resulted in a major issue in 1977, as demand exceeded production capacity for the Oldsmobile V8, and as a result Oldsmobile quietly began equipping some full size Delta 88 models and the very popular Cutlass/Cutlass Supreme with the Chevrolet 350 engine instead (each division of GM produced its own 350 V8 engine). Many customers were loyal Oldsmobile buyers who specifically wanted the Rocket V8, and did not discover that their vehicle had the Chevrolet engine until they performed maintenance and discovered that purchased parts did not fit. This led to a class-action lawsuit which became a public relations nightmare for GM. Following this debacle, disclaimers stating that "Oldsmobiles are equipped with engines produced by various GM divisions" were tacked onto advertisements and sales literature; all other GM divisions followed suit. In addition, GM quickly stopped associating engines with particular divisions, and to this day all GM engines are produced by "GM Powertrain" (GMPT) and are called GM "Corporate" engines instead of GM "Division" engines. Although it was the popularity of the Oldsmobile division vehicles that prompted this change, declining sales of V8 engines would have made this change inevitable as all but the Chevrolet (and, later, Cadillac's Northstar) versions were eventually dropped. In the 1980 model year, a full line of automobiles on the X-body platform, anchored by the Chevrolet Citation, was launched. Again, these cars were all quite popular in their respective segments for the first couple of years, but brake problems, and other defects, ended up giving them, known to the public as "X-Cars", such a bad reputation that the 1985 model year was their last. The J-body cars, namely the Chevrolet Cavalier and Pontiac Sunbird, took their place, starting with the 1982 model year. Quality was better, but still not exemplary, although good enough to survive through three generations to the 2005 model year. They were produced in a much-improved Lordstown Assembly plant, as were their replacements, the Chevrolet Cobalt and Pontiac Pursuit/G5. Roger B. Smith served as CEO throughout the 1980s. GM profits struggled from 1981 to 1983 following the late 1970s and early 1980s recession. In 1981, the UAW negotiated some concessions with the company in order to bridge the recession. GM profits rebounded during the 1980s. During the 1980s, GM had downsized its product line and invested heavily in automated manufacturing. It also created the Saturn brand to produce small cars. GM's customers still wanted larger vehicles and began to purchase greater numbers of SUVs. Roger Smith's reorganization of the company had been criticized for its consolidation of company divisions and its effect on the uniqueness of GM's brands and models. His attempts to streamline costs were not always popular with GM's customer base. In addition to forming Saturn, Smith also negotiated joint ventures with two Japanese companies (NUMMI in California with Toyota, and CAMI with Suzuki in Canada). Each of these agreements provided opportunities for the respective companies to experience different approaches. The decade of the 1990s began with an economic recession, taking its inevitable toll on the automotive industry, and throwing GM into some of its worst losses. As a result, "Jack" Smith (not related to Roger) became burdened with the task of overseeing a radical restructuring of General Motors. Sharing Roger's understanding of the need for serious change, Jack undertook many major revisions. Reorganizing the management structure to dismantle the legacy of Alfred P. Sloan, instituting deep cost-cutting and introducing significantly improved vehicles were the key approaches. These moves were met with much less resistance within GM than had Roger's similar initiatives as GM management ranks were stinging from their recent near-bankruptcy experience and were much more willing to accept the prospect of radical change. Following the first Persian Gulf War and a recession GM's profits again suffered from 1991 to 1993. For the remainder of the decade the company's profits rebounded and it made market share gains with the popularity of its SUVs and pick-up truck lines. Rick Wagoner had served as the company's Chief Financial Officer during this period in the early 1990s. GM's foreign rivals gained market share especially following U.S. recessionary periods while the company recovered. U.S. trade policy and foreign trade barriers became a point of contention for GM and other U.S. automakers who had complained that they were not given equal access to foreign markets. Trade issues had prompted the Reagan administration to seek import quotas on some foreign carmakers. Later, the Clinton administration engaged in trade negotiations to open foreign markets to U.S. automakers with the Clinton administration threatening trade sanctions in efforts to level the playing field for U.S. automakers. José Ignacio ("Inaki") López de Arriortúa, who worked under Jack Smith in both Europe (particularly the successful turnaround of Opel) and the United States, was poached by Volkswagen in 1993, just hours before Smith announced that López would be promoted to head of GM's North American operations. He was nicknamed Super López for his prowess in cutting costs and streamlining production at GM, although critics said that his tactics angered longtime suppliers. GM accused López of poaching staff and misappropriating trade secrets, in particular taking documents of future Opel vehicles, when he accepted a position with VW. German investigators began a probe of López and VW after prosecutors linked López to a cache of secret GM documents discovered by investigators in the apartment of two of López's VW associates. G.M. then filed suit in a United States District Court in Detroit, using part of the Racketeer Influenced and Corrupt Organizations Act, which left VW open to triple damages (billions of dollars) if the charges were proved in court. VW, faced with a plummeting stock price, eventually forced López to resign. GM and Volkswagen since reached a civil settlement, in which Volkswagen agreed to pay GM $100 million and to buy $1 billion worth of parts from GM. After GM's lay-offs in Flint, Michigan, a strike began at the General Motors parts factory in Flint on June 5, 1998, which quickly spread to five other assembly plants and lasted seven weeks. Because of the significant role GM plays in the United States, the strikes and temporary idling of many plants noticeably showed in national economic indicators. In the early 1990s, following the first Gulf War and a recession, GM had taken on more debt. By the late 1990s, GM had regained market share; its stock had soared to over $80 a share by 2000. However, in 2001, the stock market drop following the September 11, 2001 attacks, combined with historic pension underfunding, caused a severe pension and benefit fund crisis at GM and many other American companies and the value of their pension funds plummeted. After gaining market share in the late 1990s and making enormous profits, General Motors stock soared to over $80 a share. From June 1999 to September 2000, the Federal Reserve, in a move to quell potential inflationary pressures created by, among other things, the stock market, made successive interest rate increases, credited in part for "plunging the country into a recession." The recession and the volatile stock market created a pension and benefit fund crisis at General Motors and many other American companies. General Motors' rising retiree health care costs and Other Post Employment Benefit (OPEB) fund deficit prompted the company to enact a broad restructuring plan. Although GM had already taken action to fully fund its pension plan, its OPEB fund became an issue for its corporate bond ratings. GM had expressed its disagreement with the bond ratings; moreover, GM's benefit funds were performing at higher than expected rates of return. Then, following a $10.6 billion loss in 2005, GM acted quickly to implement its restructuring plan. For the first quarter of 2006 GM earned $400 million, signaling that a turnaround had already begun even though many aspects of the restructuring plan had not yet taken effect. In 2003, GM responded to the crisis by fully funding its pension fund with a $15 B payment; however, its Other Post Employment Benefits Fund (OPEB) became a serious issue resulting in downgrades to its bond rating in 2005. The company expressed its disagreement with these bond rating downgrades. In the late 1990s, the U.S. economy was on the rise and GM and Ford gained market share producing enormous profits primarily from the sale of light trucks and sport-utility vehicles. Following the September 11, 2001 attacks, a severe stock market decline caused a pension and benefit fund underfunding crisis. GM began its Keep America Rolling campaign, which boosted sales, and other auto makers were forced to follow suit. The U.S. automakers saw sales increase to leverage costs as gross margins deteriorated. Although retiree health care costs remain a significant issue, General Motors' investment strategy has generated a $17.1 billion surplus in 2007 in its $101 billion U.S. pension fund portfolio, a $35 billion reversal from its $17.8 billion of underfunding. In February 2005, GM successfully bought itself out of a put option with Fiat for $2 billion USD (€1.55 billion). In 2000, GM had sold a 6% stake to Fiat in return for a 20% share in the Italian automaker. As part of the deal, GM granted Fiat a put option, which, if the option had been exercised between January 2004 and July 2009, could have forced GM to buy Fiat. GM had agreed to the put option at the time, perhaps to keep it from being acquired by another automaker, such as Daimler AG, competing with GM's German subsidiary Opel. The relationship suffered and Fiat had failed to improve. In 2003, Fiat recapitalized, reducing GM's stake to 10%. In February 2006, GM slashed its annual dividend from $2.00 to $1.00 per share. The reduction saved $565 million a year. In March 2006, GM divested 92.36 million shares (reducing its stake from 20% to 3%) of Japanese manufacturer Suzuki, in order to raise $2.3 billion. GM originally invested in Suzuki in the early 1980s. On March 23, 2006, a private equity consortium including Kohlberg Kravis Roberts, Goldman Sachs Capital, and Five Mile Capital purchased $8.8 billion, or 78% of GMAC's commercial mortgage arm. The name of the new entity, in which GMAC owns a 21% stake, is Capmark Financial Group. On April 3, 2006, GM announced that it would sell 51% of GMAC as a whole to a consortium led by Cerberus Capital Management, raising $14 billion over three years. Investors also included Citigroup's private equity arm and Aozora Bank of Japan. The group will pay GM $7.4 billion in cash at closing. GM will retain approximately $20 billion in automobile financing worth an estimated $4 billion over three years. GM sold its remaining 8% stake in Isuzu, which had peaked at 49% just a few years earlier, on April 11, 2006, to raise an additional $300 million. 12,600 workers from Delphi, a key supplier to GM, agreed to buyouts and an early retirement plan offered by GM in order to avoid a strike, after a judge agreed to cancel Delphi's union contracts. 5,000 Delphi workers were allowed to flow to GM. In 2006, GM offered buyouts to hourly workers to reduce future liability; over 35,000 workers responded to the offer, well exceeding the company's goal. GM gained higher rates of return on its benefit funds as a part of the solution. Stock value began to rebound - as of October 30, 2006, GM's market capitalization was about $19.19 billion. GM stock began the year 2006 at $19 a share, near its lowest level since 1982, as many on Wall Street figured the ailing automaker was bound for bankruptcy court. But GM remained afloat and the company's stock in the Dow Jones industrial average posted the biggest percentage gain in 2006. In June 2007, GM sold its military and commercial subsidiary, Allison Transmission, for $5.6 billion. Having sold off the majority, it will, however, keep its heavy-duty transmissions for its trucks marketed as the Allison 1000 series. During negotiations for the renewal of its industry labor contracts in 2007, the United Auto Workers (UAW) union selected General Motors as the "lead company" or "strike target" for pattern bargaining. Late in September, sensing an impending impasse in the talks, the union called a strike, the first nationwide walkout since 1970 (individual plants had experienced local labor disruptions in the interim). Within two days, however, a tentative agreement was achieved and the strike ended. On June 28, 2007, GM agreed to sell its Allison Transmission division to private equity firms Carlyle Group and Onex for $5.1 billion. The deal will increase GM's liquidity and echoes previous moves to shift its focus towards its core automotive business. The two firms will control seven factories around Indianapolis but GM will retain management of a factory in Baltimore. Former Allison Transmission president Lawrence E. Dewey will be the new CEO of the standalone company. Kirk Kerkorian once owned 9.9 percent of GM. According to press accounts from June 30, 2006, Kerkorian suggested that Renault acquire a 20 percent stake in GM to rescue GM from itself. A letter from Tracinda (Kerkorian's investment vehicle) to Rick Wagoner was released to the public to pressure GM's executive hierarchy, but talks failed. On November 22, 2006, Kerkorian sold 14 million shares of his GM stake (it is speculated that this action was due to GM's rejection of Renault and Nissan's bids for stakes in the company as both of these bids were strongly supported by Kerkorian); the sale resulted in GM's share price falling 4.1% from its 20 November price, although it remained above $30/share. The sale lowered Kerkorian's holding to around 7% of GM. On November 30, 2006,Tracinda said it had agreed to sell another 14 million shares of GM, cutting Kerkorian's stake to half of what it had been earlier that year. By the end of November 2006, he had sold substantially all of his remaining GM shares. After Kerkorian sold, GM lost more than 90% of its value, falling as low as $1/share by May 2009. On February 12, 2008, GM announced its operating loss was $2 billion (with a GAAP loss of $39 billion including a one time accounting charge). GM offered buyouts to all its UAW members. On March 24, 2008, GM reported a cash position of $24 billion, or $6 billion less than what was on hand September 31, 2007, which is a loss of $1 billion a month. A further quarterly loss of $15.5 billion, the third-biggest in the company's history, was announced on August 1, 2008. On November 17, 2008, GM announced it would sell its stake in Suzuki Motor Corp. (3.02%) for 22.37 billion yen ($230 million) in order to raise much needed cash to get through the 2008 economic crisis. In 2008, 8.35 million GM cars and trucks were sold globally under the brands Vauxhall, Buick, Cadillac, Chevrolet, GMC, GM Daewoo, Holden, Pontiac, Hummer, Saab, Saturn, Wuling and Opel of Germany. In late 2008 GM, along with Chrysler, received loans from the American, Canadian, and Ontarian governments to bridge the late-2000s recession, record oil prices, and a severe global automotive sales decline (see also automotive industry crisis of 2008–2009) due to the global financial crisis of 2008–2009. On February 20, 2009, GM's Saab division filed for reorganization in a Swedish court after being denied loans from the Swedish government. On April 27, 2009, GM announced that it would phase out the Pontiac brand by the end of 2010 and focus on four core brands in North America: Chevrolet, Cadillac, Buick, and GMC. It announced that the resolution (sale) of its Hummer, Saab, and Saturn brands would take place by the end of 2009. (By November, however, proposed deals to sell Saturn to Penske and Saab to Koenigsegg had failed to materialize.) The company had previously cancelled Oldsmobile. In 2009, a new corporate entity, General Motors Company LLC, replaced the old General Motors Corporation, being separate and independent. On May 30, 2009, it was announced that a deal had been reached to transfer GM's Opel assets to a separate company, majority-owned by a consortium led by Sberbank of Russia (35%), Magna International (20%), and Opel employees (10%). GM was expected to keep a 35% minority stake in the new company. However, GM delayed acceptance of the deal pending other bids, notably a proposed 51% stake by Beijing Automotive. By early July, a decision had not been made, but Magna remained confident and scheduled a meeting for July 14 to announce its acceptance. After months of deliberation, however, GM decided on November 3, 2009, to retain full ownership of the German carmaker Opel, thus voiding the tentative deal with the Magna consortium. In June 2010, the company established General Motors Ventures, a subsidiary designed to help the company identify and develop new technologies in the automotive and transportation sectors. General Motors was criticized for its presence in apartheid South Africa. The company withdrew after pressure from consumers, stockholders and Leon H. Sullivan. It retained a commercial presence, however, in the form of its Opel subsidiary. Right Hand Drive Opel & Vauxhall production took place in GM's Uitenhage plants outside Port Elizabeth in the Eastern Cape Province, and does so to this day. In 1925 General Motors settled down in Argentina and started producing the Double Phaeton standard and the Double Phaeton called "Especial Argentino". The production was completed with a sedan model, a roadster and a truck chassis also adaptable to transporting of passengers. Sales increased and soon the Oldsmobile, Oakland and Pontiac brands were incorporated into the assembly line; the capacity of the facility was not enough to supply the increasing demand and the building of a new plant was required. A new 48,000 m2 plant with a covered area was opened in 1929, and since then the Buick, Marquette, La Salle, Cadillac, Vauxhaul and Opel marques also started to be produced. When the Second World War broke out the operations were complicated. In 1941, 250.000 Chevrolets were made, but shortage of parts made car production impossible. The last Chevrolet left the plant in August, 1942. though in order to avoid total stoppage, the company made electrical and portable refrigerators and car accessories in addition to other items. After the war, GM started producing the Oldsmobile and Pontiac lines and later Chevrolet was added. Production resumed in 1960 with Chevrolet pickups and shortly thereafter in 1962 it started assembling the first/second generation Chevy II until 1974 as Chevrolet 400, and the early third-generation (1968 model) Nova as the Chevrolet Chevy from late 1969 through 1978, both models overlapping for several years, the Chevy II marketed as a family sedan while the Nova as a sporty alternative. Thenceforth several Opel models and Chevrolet pickups are being manufactured. In 1984, GM acquired Electronic Data Systems Corporation (EDS), a leading data processing and telecommunications company, to be the sole provider of information technology (IT) services for the company. EDS became independent again in 1996, signing a 10-year agreement to continue providing IT services to General Motors. Delco Electronics Corporation was the automotive electronics design and manufacturing subsidiary of General Motors. The name Delco came from the Dayton Engineering Laboratories Co., founded in Dayton, Ohio by Charles Kettering and Edward A. Deeds. Delco was responsible for several innovations in automobile electric systems, including the first reliable battery ignition system and the first practical automobile self starter. In 1936 Delco began producing the first dashboard-installed car radios. By the early 1970s Delco had become a major supplier of automotive electronics equipment. Based in Kokomo, Indiana, Delco Electronics employed more than 30,000 at its peak. In 1962 GM created the General Motors Research Laboratories, based in Santa Barbara, California, to conduct research and development activities on defense systems. This organization was eventually merged into Delco Electronics and renamed Delco Systems Operations. In 1985 General Motors purchased Hughes Aircraft and merged it with Delco Electronics to form Hughes Electronics Corporation, an independent subsidiary. In 1997 all of the defense businesses of Hughes Electronics (including Delco Systems Operations) were merged with Raytheon, and the commercial portion of Delco Electronics was transferred to GM's Delphi Automotive Systems business. Delphi became a separate publicly traded company in May 1999, and continued to use the Delco Electronics name for several of its subsidiaries through approximately 2004. Although Delco Electronics no longer exists as an operating company, GM still retains rights to the Delco name and uses it for some of its subsidiaries including the AC Delco parts division. Hughes Electronics Corporation was formed on December 31, 1985, when Hughes Aircraft Company was sold by the Howard Hughes Medical Institute to General Motors for $5.2 billion. General Motors merged Hughes Aircraft with its Delco Electronics unit to form Hughes Electronics Corporation, an independent subsidiary. This division was a major aerospace and defense contractor, civilian space systems manufacturer and communications company. The aerospace and defense business was sold to Raytheon in 1997 and the Space and Communications division was sold to Boeing in 2000. Hughes Research Laboratories became jointly owned by GM, Raytheon, and Boeing. In 2003, the remaining parts of Hughes Electronics were sold to News Corporation and renamed The DirecTV Group. Delphi was spun off from General Motors on May 28, 1999. Delphi is one of the largest automotive parts manufacturers and has approximately 185,000 employees (50,000 in the United States). With offices worldwide, the company operates 167 wholly owned manufacturing sites, 41 joint ventures, 53 customer centers and sales offices, and 33 technical centers in 38 countries. Delphi makes the Monsoon premium audio systems found in some GM and other manufacturer automobiles. On October 8, 2005, Delphi filed for Chapter 11 bankruptcy. On March 31, 2006, Delphi announced it would sell off or close 21 of its 29 plants in the United States. Detroit Diesel was originally the GM Diesel Division then Detroit Diesel Allison Division until 1988. It made diesel engines for truck, generating set and marine use. Electro-Motive Diesel (EMD) was originally the Electro-Motive Division of GM, until 2005. It made diesel engines and locomotives. See also General Motors Diesel Division and GM Defense. By the end of 2006, GM had completed the divestiture of 51% of its financing unit, GMAC. Currently GM is a 10% owner in GMAC. In August 1938, a senior executive for General Motors, James D. Mooney, received the Grand Cross of the German Eagle for his distinguished service to the Reich. "Nazi armaments chief Albert Speer told a congressional investigator that Germany could not have attempted its September 1939 Blitzkrieg of Poland without the performance-boosting additive technology provided by Alfred P. Sloan and General Motors". During the war, GM's Opel Brandenburg facilities produced bombers JU-88, trucks, land mines and torpedo detonators for Nazi Germany. "Alfred P. Sloan, James D. Mooney, John T. Smith and Graeme K. Howard remained on the Opel board . . . in flagrant violation of existing legislation, information, contacts, transfers and trade continued [throughout the war] to flow between the firm's Detroit headquarters and its subsidiaries both in Allied countries and in territories controlled by the Axis powers. The financial records of Opel Rüsselsheim revealed that between 1942 and 1945 production and sales strategy were planned in close coordination with General Motors factories throughout the world.... In 1943, while its American manufacturers were equipping the United States Air Force, GM's German counterpart were developing, manufacturing and assembling motors for the Messerschmitt 262, the first jet fighter in the world. This innovation gave the Nazis a basic technological advantage. With speeds up to 540 miles per hour, this aircraft could fly 100 miles per hour faster than its American rival, the piston-powered Mustang P51." "GM destroyed Sloan's files to protect itself from lawsuits regarding antitrust issues, the neglect of automobile safety and its investments in Nazi Germany." Sloan's memoir presents a different picture of Opel's wartime existence. According to Sloan, Opel was nationalized (along with most other industrial activity owned or co-owned by foreign interests) by the German state soon after the outbreak of war. Sloan presents Opel at the end of the war as a black box to GM's American management—an organization that the Americans had had no contact with for 5 years. According to Sloan, GM in Detroit debated whether to even try to run Opel in the postwar era, or to leave to the interim West German government the question of who would pick up the pieces. Defending the German investment strategy as "highly profitable", Alfred P. Sloan told shareholders in 1939 GM's continued industrial production for the Nazi government was merely sound business practice. In a letter to a concerned shareholder, Sloan said that the manner in which the Nazi government ran Germany "should not be considered the business of the management of General Motors...We must conduct ourselves as a German organization. . . We have no right to shut down the plant." After 20 years of researching General Motors, Bradford Snell stated, "General Motors was far more important to the Nazi war machine than Switzerland ... Switzerland was just a repository of looted funds. GM's Opel division was an integral part of the German war effort. The Nazis could have invaded Poland and Russia without Switzerland. They could not have done so without GM." The Great American Streetcar Scandal is an unproven theory developed by Robert Eldridge Hicks in 1970 and published by Grossman Publishers in 1973 in the book "Politics of Land, Ralph Nader's Study Group Report on Land Use in California" at pp. 410–12, compiled by Robert C. Fellmeth, Center for Study of Responsive Law, and put forth by Bradford Snell again in 1974, in which GM, along with road-builders, is alleged to have engaged in a policy that triggered the shift from the mass transportation of the previous century to the 'one-person-one-car' trip of today. The theory states that in order to expand auto sales and maximize profits GM bought local mass transit systems and privately owned railways, following which it would proceed to eliminate them and replace them all with GM-built buses. Alternative versions of the events have been put forth by scholars in the field. Slater, Cosgrove and Span all put forth evidence that counters Snell's theory. Consumer advocate, Ralph Nader, issued a series of attacks on vehicle safety issues from GM – particularly the Chevrolet Corvair – in his book Unsafe at Any Speed, written in 1965. Being the first major action taken by Nader, he soon established his reputation as a crusader for safety. GM was then accused of sending spies after him. "A woman at the supermarket confronted me and said, 'How would you like to have a talk on foreign affairs?' This wasn't a classroom, this was a supermarket, I was buying cookies - I don't think she wanted to talk about foreign affairs, I think she wanted to talk about domestic affairs", Nader said in the 2006 documentary An Unreasonable Man. Agents were supposedly trying to fix his mind and get him to engage in sexual activity. "Mother would get calls saying, 'We've got a package for Mr. Ralph Nader at 9 AM.' There would also be threats like, 'You better back off, buddy boy'", said Claire, Nader's sister. GM was put on trial for attempting manipulation with Nader, Robert Kennedy and numerous other notable figures present at the trial. In the end, the CEO apologized to Nader; however, Nader continued to work against General Motors. In 1980, J. Patrick Wright wrote a book named On a Clear Day You Can See General Motors. This book, which critics acclaimed "blows the lid off the king of carmakers" was about the allegations of corruption, "mismanagement and total irresponsibility" at the top level of the company, as seen by John Z. DeLorean, the Vice-President, who, in 1973, resigned from his position in spite of a brilliant and meteoric rise. He was earning $650,000 per year and was expected to be the next President of GM. Last updated on 9 August 2015 at 18:45.